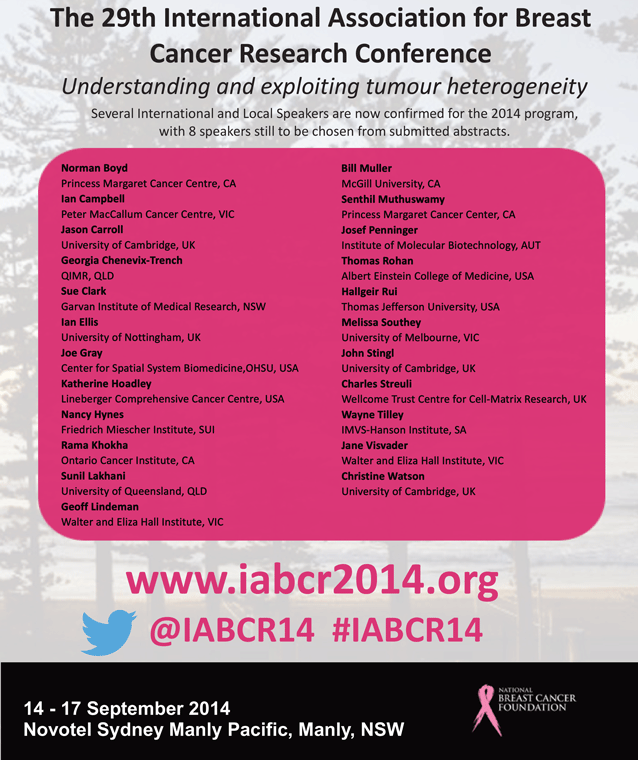 Great news, Cell Division Lab and Dr Andrew Burgess will be presenting a Poster of some of our latest research at the 29th International Association for Breast Cancer Research Conference (#IABCR14). The conference will be held from the 14 – 17 September 2014 at The Novotel Sydney Manly, New South Wales, and has an amazing line up of world class speakers, is is sure to be an excellent conference. This entry was posted in News and tagged breast cancer, Breast cancer conference, cell division, Dr Andrew Burgess, Garvan, IABCR14, International Association for Breast Cancer Research Conference, Kinghorn Cancer Center, Peter Mac, QIMR, Walter & Eliza Hall Institute.